Windset takes part in the CIBC Run For The Cure! 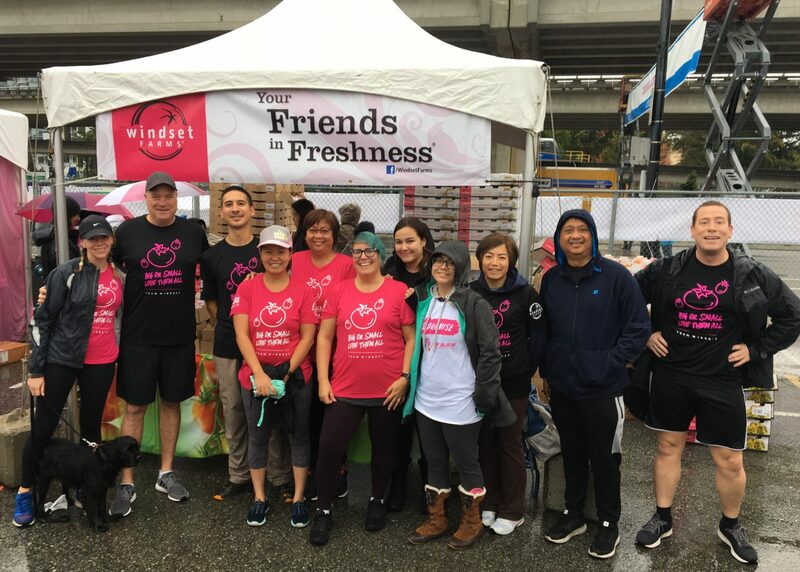 On Sunday, September 30th Windset Farms® took part in the annual 2018 Canadian Breast Cancer Foundation CIBC Run for the Cure. This 5 km run, and 1 km walk took participants through the streets of Vancouver, and despite the rainy weather, everyone joined together to honour those who have been lost and celebrate the milestones that have been made in fighting this disease. Team Windset was there with smiling faces wearing their “Big or Small, We Love Them All” pink t-shirts. Runners were able to stop by the souvenir tent to pick up their own t-shirt, along with some healthy Fresco® Mini Cucumbers and Concerto® Grape Tomatoes to snack on after the race. Windset is proud to be a regional sponsor of the Run for the Cure for the seventh consecutive year. Together, with the support of donors and sponsors, over $16.2 million has been raised in support of Breast Cancer Research through this amazing event. Windset would like to thank each and every donor, sponsor, and runner for contributing to the fight to end cancer. One in eight women will be diagnosed with breast cancer in their lifetime. Events like these allow us to come together and generate funding for life saving treatments, research, and support programs. Proceeds raised go to the Canadian Cancer Foundation, the largest charitable funder of breast cancer research in Canada. For more information on how you can join next years CIBC Run For The Cure, or if you would like to make a donation, please click here. Together, we can beat cancer!